Across Africa, examples of foreign direct investment (FDI) are evident. China has taken the lead, with the continent being at the heart of its One Belt, One Road initiative. Now other countries are following suit. Brazil, for instance, built Ghana’s largest flyover in Accra. Germany, meanwhile, launched the ‘Marshall plan for Africa‘ in 2018, which will see it assist in the establishment of infrastructure that will help promote African exports. As governments across the continent continue to take steps to liberalise and diversify their economies, Africa has become home to some of the world’s fastest-growing economies. Consequently, opportunities to invest in the continent have become more abundant than ever before. In light of this phenomenon, World Finance lists the top five fasting-growing economies in Africa, according to the World Economic Forum. Efforts to modernise Ethiopia’s economy have paid off. A wave of privatisation, with state-owned companies being sold to overseas investors in China, saw FDI growth hit 27.6 percent in 2016/17. The Ethiopian Government has also stepped up to the plate with substantial state investment to boost infrastructure and support sustainable solutions. Hoping to rival the manufacturing sectors of China and India thanks to its cheap labour costs, the country has also made efforts to improve its trading relationships and promote Ethiopian products. However, the modernisation of the economy has not been all smooth sailing: as the country moves away from its reliance on agriculture, the reforms have sparked public unrest and raised concerns about the government’s human rights record. The Ivory Coast is one of the nations that benefitted from the 50 percent African franc devaluation in 1994. This helped to control the resulting hike in inflation, while making exports more competitive. The nation also benefits from excellent infrastructure, making it attractive to foreign inflows. This is boosted further by the government stepping up a programme called the National Development Plan (NDP) for 2016-20, which is aimed at encouraging investment. Challenges remain, however: the Intergovernmental Panel on Climate Change released a report in 2018 that highlighted the effects of climate change on nations such as the Ivory Coast. The country has a heavy coastal population of 7.5 million, contributing to 80 percent of its GDP. The report predicts that, on the current path, climate-induced impacts are expected to “drive the loss of coastal resources”. Senegal is one of Africa’s most stable countries, experiencing three peaceful political transitions since it gained independence from France in 1960. However, increased extremism in neighbouring countries has been a cause for concern in recent years. Senegal’s economy remains highly dependent on agriculture, accounting for 15.4 percent of GDP, though variable weather conditions can play a large part in this figure. Fortunately, the nation has a highly developed tourism industry, and with its extensive coastline, it also operates as a shipping hub – another driving force behind its high growth rates. Dakar, as the capital of the former federation of French West Africa, is home to numerous banks and institutions that serve the continent’s Francophone countries. East Africa’s second-largest economy, Tanzania, is a nation in transition. But despite the country’s promising GDP growth rates, an estimated 46 percent of the population remains in poverty: many of the gains in GDP have so far been unequally shared between citizens. 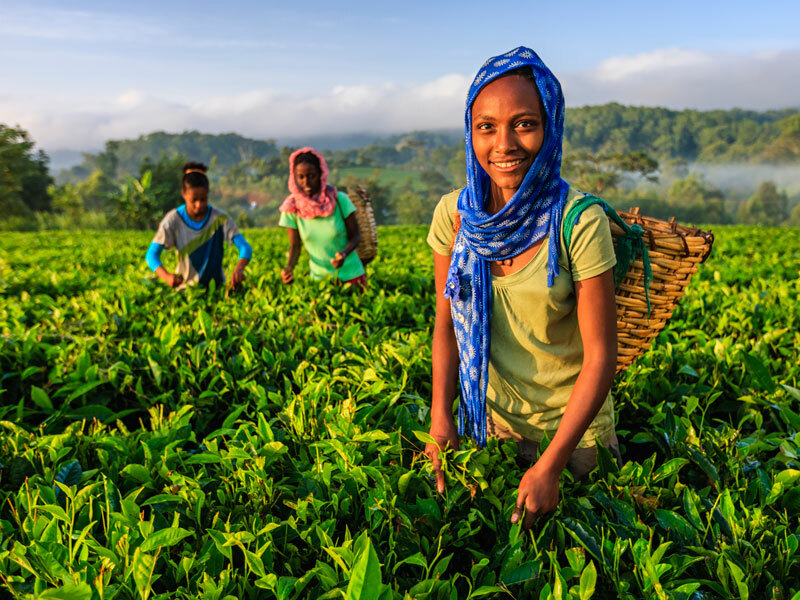 As with others in this list, Tanzania remains highly dependent on agriculture with no signs of this abating – in fact, between 2014 and 2015, the sector’s contribution to GDP increased by 0.2 percent. That said, the nation is also a regional leader in the financial services sector. The Bank of Tanzania allows non-banking institutions to provide financial services, a daring move that has proved to be rewarding. The country also benefits from a stable deficit that has remained modest – 2.1 percent in 2017/18 – meaning investments into the country pose less risk than others on the continent. Neighbour to the Ivory Coast, Ghana is the third Western African country to feature on the list. The country boasts a rich range of resources: it is Africa’s second-largest producer of gold, and has an abundant supply of diamonds and oil. To supplement trade, Ghana imposes various tariffs or barriers compared to neighbouring countries, and its depreciating currency has made the nation’s exports more competitive. Consequently, agriculture accounts for around 20 percent of GDP, while also employing half of the country’s workforce. However, in 2015, a drop in oil prices and lax government spending forced Ghana to apply for an IMF bailout of $1bn. It is on track to exit the agreement later this year.